Q: Do I have to grind the starter pocket when adapting this transmission to a Cummins? A: No, you do not have to do any grinding to the bell housing for starter clearance. Q: How is the 5R110 transmission tuned? A: DCS maintains the stock Ford TCM/PCM and harness, and with the use of SCT Tuners we modify 5R110 shift points and torque converter lock-up to perform behind the Cummins engine. Read up on our Ford TCM tuning for more detail. 5R110 tuning is only available for 6.0L and 6.4L diesel trucks. Access to a computer and email is required, a laptop is recommended for datalogging but not required. Transmission tuning for gas trucks with 5R110 is not supported. Replacement of the 5R110 with a 4R100 is a viable option in gas trucks. An aftermarket controller, such as US Shift, is required for this conversion. Q: Will my tow/haul button still work? A: Yes, the tow/haul function is retained with DCS transmission tuning. Q: Will the transmission temperature gauge in my dash work? What about my neutral safety and reverse lights? A: When used with our tuning and wiring instructions, the stock transmission temperature gauge, neutral safety, and reverse light functions all work- even with aftermarket control. Q: Are shift points adjustable? A: Yes, Shift and torque converter lock up points are completely adjustable, making it possible to optimize your power train for your specific needs. Q: I have heard that I need a different torque convertor. Is this true? A: The 6.0/6.4 diesel torque converter works just fine in most cases. Our adapter plates and flex plates are designed to work with a stock configuration torque converter. If you are planning to turn your Cummins horsepower levels up we would recommend a high performance torque convertor to prevent torque convertor clutch slippage. If you are concerned about getting the maximum power transfer efficiency possible, then you may also consider a custom converter with a different stall speed. Stall speed is perhaps the most misunderstood function of a transmission. We have talked to more than a few customers who got a custom converter that ended up having a higher stall than a stock one. If you are concerned about convertor stall speed we recommend getting some references from a reputable local transmission shop. Be aware there is a lot of bad information out there. We use the stock and original converter for most of the conversions we do in our shop. Q: Is the 5R110 a good transmission to swap in an older truck? A: Due to the tuning required we do not recemmend using the 5R110 transmission in older trucks. A 4R110 is often a preferred choice. Q: Will my Ford warranty still cover the transmission? A: Probably not, but it depends on the dealer you work with. Your chances will be better if you choose to use the stock system. Q:Do you have any comparison data on different transmissions? If you are installing this engine into a 1967-2002 Ford with the 5R110, the best tps option for you is a universal cable operated tps.These are available through us from either PCS or Compushift for their advertised price.If installing this engine in a 2003-2010 Ford Diesel, we have pedal bracket kits available to allow the stock pedal to be used for the throttle position sensor.If you happen to have this Cummins and it has the stock Dodge tps, it is usable, but they are very expensive to replace. 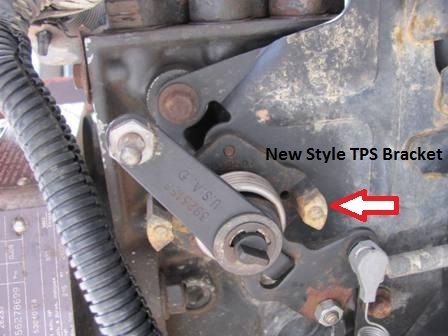 If you are installing this engine into a 1967-2002 Ford with the 5R110, the best tps option for you is the Dodge Cummins tps (as long as you have the Dodge Cummins throttle linkage- industrial versions of this engine do not have this linkage- see pictures below). If installing this engine in a 2003-2010 Ford Diesel we also have pedal bracket kits available to allow the stock adjustable or fixed pedal to be used for the throttle position sensor. See our pedal identification article to identify your pedal if you are interested in this option. These engine always have a tps, and you can share the tps signal with the transmission controller according to our wiring instructions. 5R110- These transmissions work well any conversion. Many of our customers have used them behind a 400+ horsepower Cummins just the way they are, including the stock torque converter. You do not have to do any grinding to the bellhousing for starter clearance. Our adapter plate and custom flex-plate uses the stock converter configuration, saving you from having to buy a custom dimensioned torque converter. Currently it is recommended to use an aftermarket transmission controller with this transmission. You will need a laptop computer to work together with us to get the final shift tuning just right or load different calibrations into the controller. We pre-calibrate your transmission controller according to your tire size and gear ratio as close as possible before we send you the controller. After you get your truck running, we plan on helping you learn how to use the laptop computer to data log the transmission shifting and receive edited calibrations from us via e-mail. The 5R110 often takes longer to tune than a 4R100 or E4OD, but we feel the advantages the newer 5R110 transmission has to offer outweigh this drawback. This tuning support is included in the mandatory $250.00 pre-programming and technical support fee you will see in our kit prices. Also included in this fee are modifications to the transmission controller harness we include with the transmission controller that make installation much easier for the installer. Believe us, these services are money well spent! With our technical support, the set up and adjustment of the controller is not difficult, it just requires some of your time. We recommend the owner of the truck work with us directly when it comes time to tune the transmission. Be prepared that when you first get your truck running the transmission may not shift properly and tuning can take a few days, exchanging 10 or more data logs for edited calibrations. 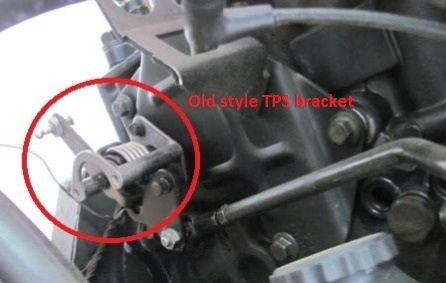 You also need to know that you will lose the switchable tow/haul features that this transmission has in the OEM application, such as higher shift points and engine braking in the tow/haul mode. The tow/haul switch becomes a cancel overdrive switch only, and engine braking can only be utilized in third and fourth gears, regardless of tow/haul selection. So be prepared that the convenience of pushing the tow/haul button to toggle between “normal” and “tow/haul” will be lost with the conversion. It is still possible however, to have another calibration that you can load into the controller with your laptop whenever you wish, and we can provide tuning that has automatic downshifts with engine braking at zero percent throttle if desired. Shift and torque converter lock up points are completely adjustable, making it possible to optimize your power train for your specific needs. The 5R110 is the strongest stock Ford transmission you can use; it was made by Ford to han-dle more power and torque than the previous transmissions. It also has 5 forward gears mak-ing it more efficient at transferring power, especially for an engine like the Cummins which makes its peak power and torque at a usable low rpm. Currently, aftermarket transmission control is required for this transmission to work in a conversion, and the controller we sell is the only controller on the market that does it. The controller has the capability to completely adjust the shift points and the torque convertor lock up points, making it a very useful tool to optimize the efficiency of your drive train. When used with our tuning and wiring instructions, the controller also enables you to retain your stock transmission temperature gauge. The controller has many optional features that you may find very valuable. It is possible to manually shift the transmission with your steering wheel switches if you like for instance. We can also provide you with custom tuning for towing or racing applications. It is possible to boost line pressures over stock settings and achieve quicker and firmer shifts that make your transmission less prone to slippage. A laptop computer is required to work together with us to tune the transmission. Conventional electronic diagnostic tools no longer work for the transmission. Electrical trans-mission problems are diagnosed with the data logging software included with the controller. Because of this your transmission may not be covered under Ford warranties. We are avail-able to help you with diagnosing electrical problems if you ever have any. The tow/haul switch becomes a cancel overdrive switch only. The controller presently does not have the capability to switch to a towing calibration or back to normal with a switch. How-ever you are able to change calibrations if you wish using your laptop computer. Q: What do I have to do to get the controller to work in my truck? A: The controller we sell is the only controller currently on the market for the 5R110, and we have many customers that are pleased with the way it works. Since the 5R110 requires precise clutch to clutch tuning, we provide valuable tuning and technical support via emails after you get the truck drivable. This requires you to have a laptop computer to send us recorded information (a datalog) and also to receive edited calibrations. Your part is very simple in this process, you just need a basic knowledge of how to attach things to emails and operate your computer, so don’t pay your mechanic to do this for you. We will even help you learn how to turn on the computer if needed. Our support is included in the $250.00 pre-programming and tech support fee. Because the 5R110 re-quires such specialized technical knowledge, this is money is well spent as we are committed to spending several hours supporting you with the controller specifically. Q: Have you had any customers that had problems with it? A: We have had a few customers who experienced transmission failures after their conversion. There is not always a solid way to judge if the controller or the tuning was at fault, due to many factors that cause transmission failure. Generally speaking, those that had failures did not take full advantage of the tuning support we offer, and they put their truck into service prematurely before the transmission was properly tuned. It is also possible to have a transmission that is in poor condition to begin with or a poorly rebuilt one. Even the type of fluid used can be a factor in how the transmission performs. Overall we have many satisfied customers who are still driving their truck with the original 5R110. Q: What can I do if I don’t have a laptop? A: You should consider buying one, especially if you want to keep your automatic. A inexpensive note-book is all that is required, or you may also consider borrowing one or a having a friend help you, but pre-pare them that it takes some time. Swapping in a 6 speed manual is also a possibility if you would rather, and we can help you with instructions. A: The 6.0 diesel torque converter works just fine in most cases. Our adapter plates and flex plates are designed to work with a stock configuration torque converter. If you are planning to turn your Cummins horsepower levels up we would recommend a high performance torque convertor to prevent torque convertor clutch slippage. If you are concerned about getting the maximum power transfer efficiency possible, then you may also consider a custom converter with a different stall speed. Stall speed is perhaps the most misunderstood function of a transmission. We have talked to more than a few customers who got a custom converter that ended up having a higher stall than a stock one. If you are concerned about convertor stall speed we recommend getting a some references from a reputable local transmission shop or from some friends. Just be aware there is a lot of bad information out there. We use the stock and original converter for most of the conversions we do in our shop.